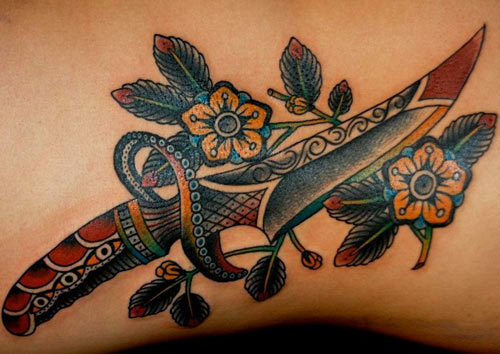 Dagger tattoos are usually symbolic inks that can be seen on the bodies of men and women all over the world. 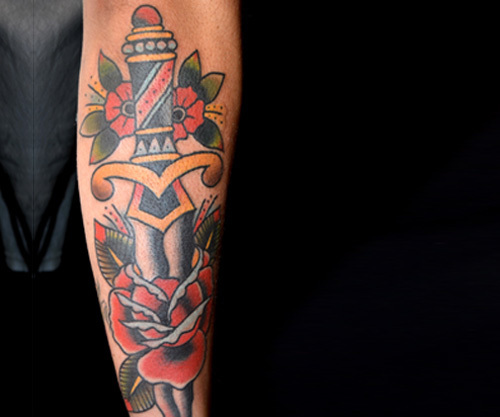 Though dagger tattoos are not considered to be a main stream tattoo, they are liked by many. Daggers have been used for display, fighting, games, and for sacrifice. 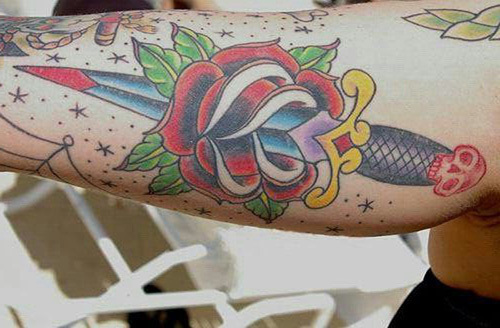 Dagger tattoos are very unique and very creative. These tattoos can be embellished with other designs easily. 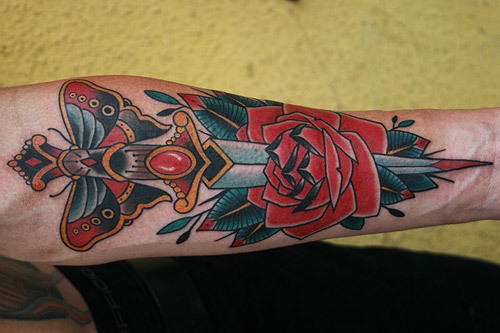 With the below mentioned designs, you are most likely to end up with more than one dagger inspired ink on your body. Let’s see the list now shall we? This is a pure dagger. It has the elements of nature around it and it is piercing through a flower making it bloom on its way. The colors are fantastic and there is so much scope to alter the various parts of it. 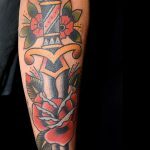 This is one of the most popular dagger patterns and is one that of course shows a heart break of a hopeless romance. Though it doesn’t depict any gory sights of bleeding of the poor heart, it shows how deep the wound is. Broken Hearts, take note! A jeweled dagger is just like beautiful faces with dark hearts. 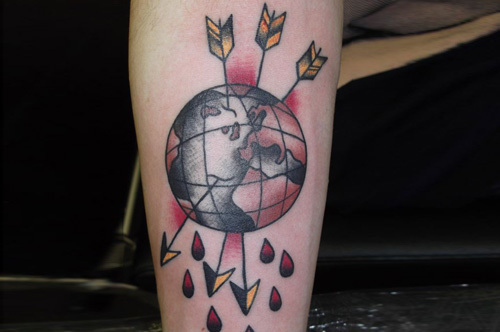 This tattoo is such a beautiful depiction of the evil that can be used for the good if one made a choice to. This is a very Goth tattoo. ‘Life is pain’, it says. The dagger is piercing through the world as you can see and this shows that the person who wears it has probably gone through something very sad. This is for those days when everything is falling upside down. This is a jeweled dagger piercing through the flower making it bleed. You can notice the blood at the tip of the dagger. It looks so similar to the first tattoo. But see the difference how the first one is optimistic and is being positive, while this one is so destructive. This pattern doesn’t depict anything, but just stays there waiting to be used for a purpose. The coloring is brilliant and emits a radiance and vibrancy which I personally love. Yet another evil dagger pattern, the skull at the head of it adds to the gore. This is the depiction of a tattoo from the Mughal Era. It has a very fabulous art work on it, which makes it rich and magnificent. A very cruel dagger in itself, this tattoo has the evil eye on its head. This makes it look scary, while it goes jabbering through the heart that it is ripping apart. You will see another heart broken guy in this depiction. This dagger comprises of a dragon around it. Though it looks beautiful thanks to all the colors, this is definitely evil and needs a strong character to be carried around. 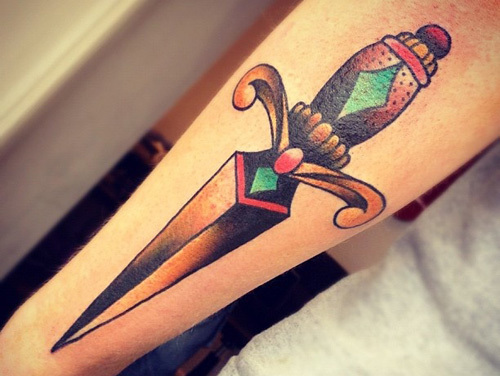 A vintage dagger, this is one the cutest dagger design out there. 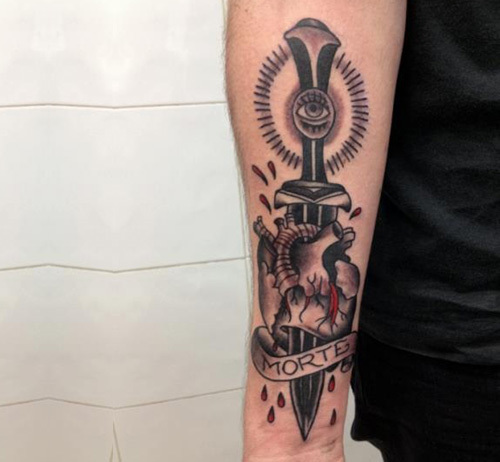 Though people have always found daggers to be more on the evil side, this tattoo even with the dripping drops of blood seems easy to carry and doesn’t disturb the onlooker. 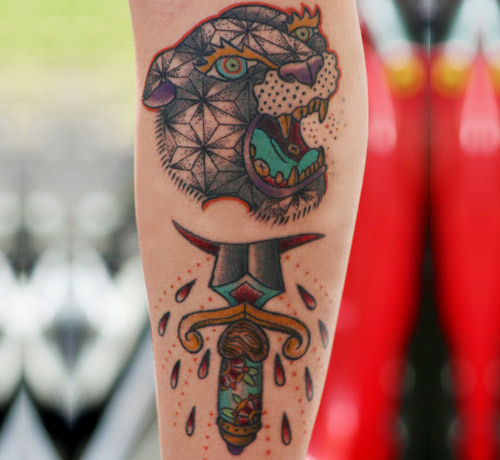 This tiger went into the way of a dagger? Or is it the head of a dagger, blood thirsty? Look at it the way you want to, but you can’t just ignore this tattoo. 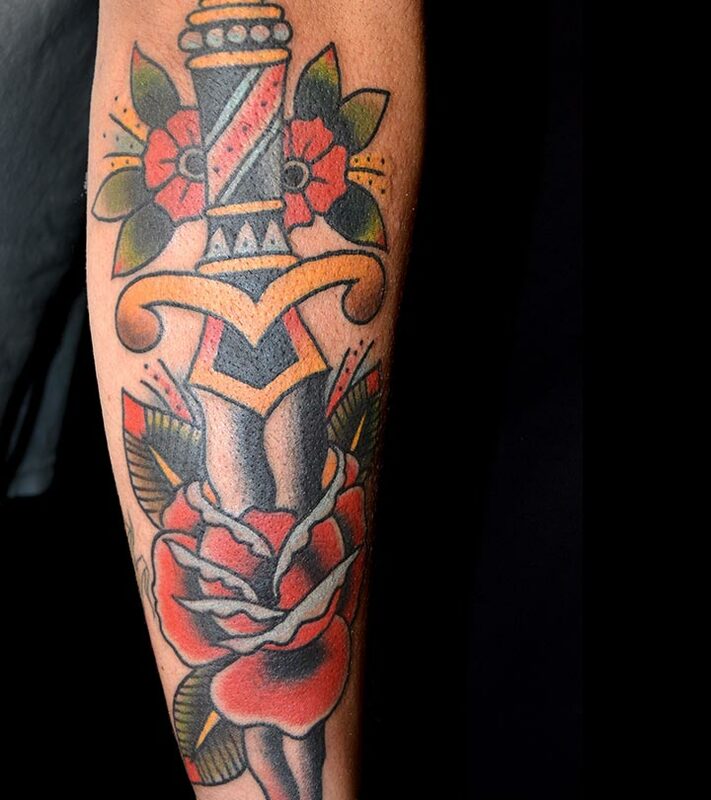 This is one the very few dagger designs out there for subtle beauties. 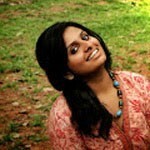 This one is simple and colorful, comprises of an evil eye but still looks sweet. 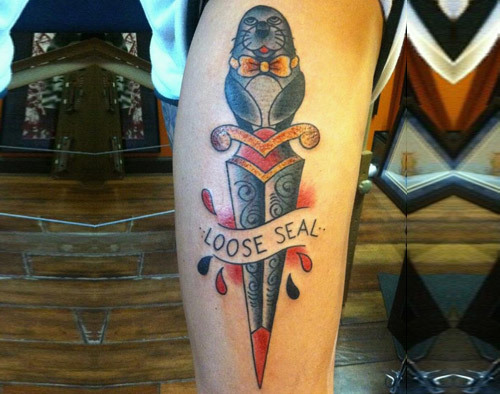 Comical daggers are in too, look at the seal head! 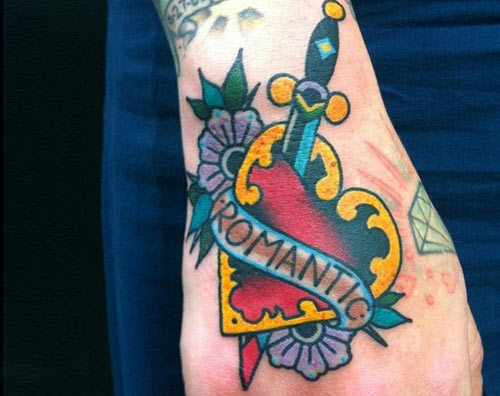 A heart, a gem and some flowers, you have yourself a cutest dagger tattoo. You like it? 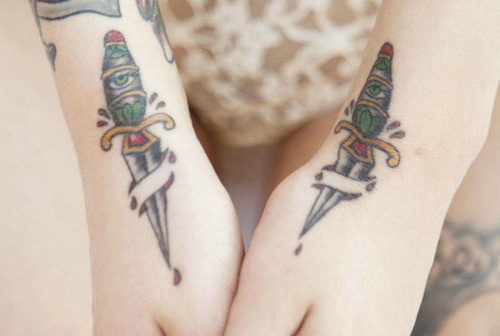 So choose any of these top 15 dagger tattoos designs that are sure to make some heads turn. Tell me which one is your favorite? Shoot a comment. 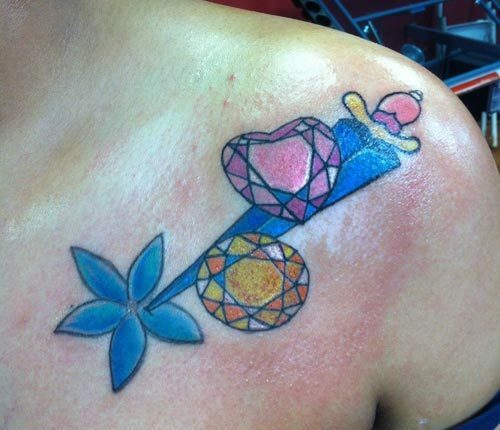 Ink your passion with a tattoo that will not be regretted. 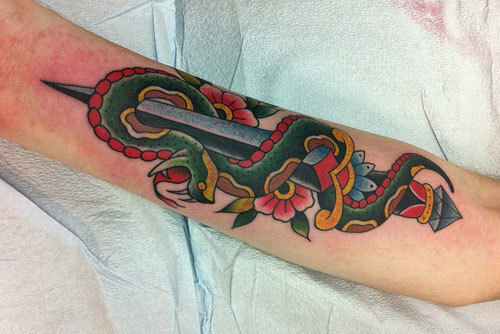 Find interesting tattoo designs on Tattoos For All to shape your idea well.